This webpage has a compilation of some known 10x8 variants, listed by year of invention. 1874 - Bird's Chess by Henry Bird, from London, U.K.
1996 - Falcon Chess by George William Duke, from U.S.A.
1999 - Modern Carrera Chess by Fergus Duniho, from U.S.A.
2004 - Grotesque Chess by Fergus Duniho, from U.S.A.
2006 - Univers Chess by Fergus Duniho, from U.S.A.
To the extent Capablanca was thinking of the next stage of chess, he settled on size 8x10. True, he may have been dawdling after becoming world champion, emulating Sam Loyd (who had just died in 1911) with peculiar, challenging novelties. It was a mixture of interest by Capablanca, because he is shown photographically with Lasker playing some SuperChess at London on some size like 8x16 or 12x16. 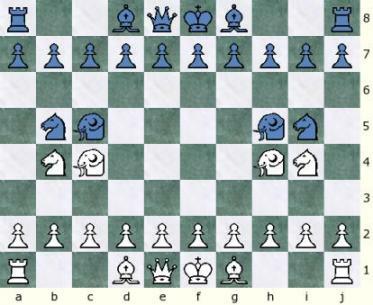 That would be in-your-face to the then-orthodoxy of Tarrasch, Marshall, Nimzowich, Alekhine. '8x10' would be Joyce Track One, and '8x16' would be Joyce Track Two. Obviously Capablanca dabbled in both. Earlier we said if we get the board right, it simplifies the task. Carrillo wonderfully traces 80 squares from Carrera to Winther. More such attempts at organization would help, such as with pieces and mutators. I began organizing pieces by types, introducing new category Multi-path to Leaper, Slider, Rider, Hopper. IAGO by Rich Hutnik has made the best start at organizing Mutators. This comment is intended as sidebar to NextChess3, where we are up to 21 CVs and growing and shows our gravitating to 8x10, rather than 9x9 and 10x10. All three of them are represented in the three CVs for next year 2009. 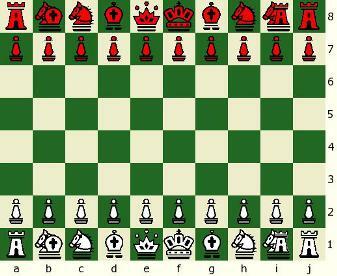 It is a bit misleading to list Capablanca Random Chess (and its Modern variant) here with a fixed array. 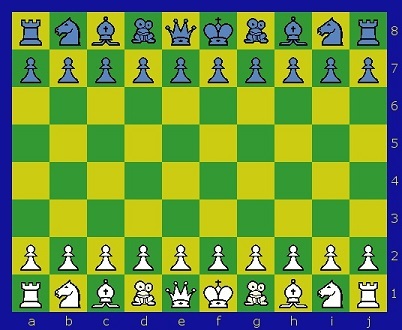 It would have been more logical to depict an empty board, with the pieces next to it... For completeness, it should at least have mentioned what the restrictions for setting up the pieces are. 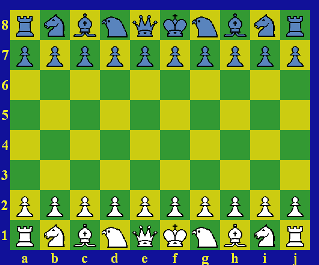 Note that most engines able to play Scharnagl's CRC are also capable of playing opening setups he explicitly excludes from being CRC, i.e. with undefended Pawns, with Bishops next to each other, or with Q and A on like colors. 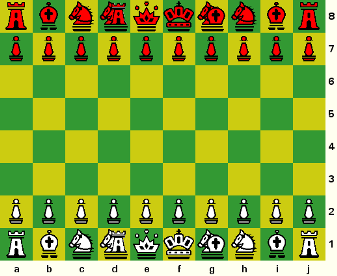 They in general consider this all the same variant, 'Capablanca Random Chess', as opening arrays in the program logic are not part of the variant definition, but are simply set by loading a FEN. 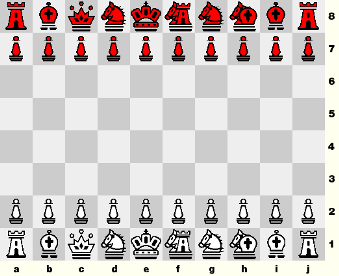 CRC in some programs is considered a different variant from Capablanca, dure to the different castling rules (like FRC is considered a distinct variant from normal FIDE Chess). Thanks Sam for the link to the different setups. It's a good reference. 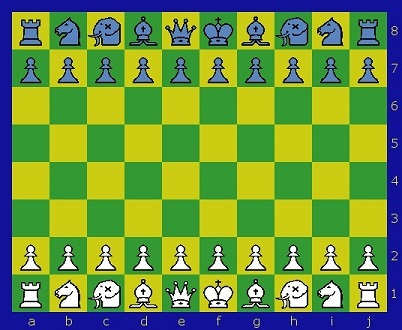 My Modern Capablanca Random Chess allows all 151,200 possible Capa setups (those that still allow castling), including those with Bishops starting on the same color. 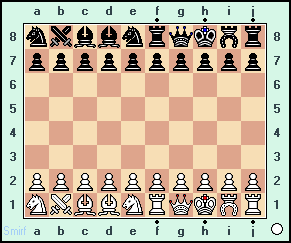 I have a list of various opening setups for Carrera/Bird/Capablanca chess here. Right now, I think Seirawan chess has the right idea; the problem with 10x8 chess is that the value of the pieces relative to each other completely change because of the new board. 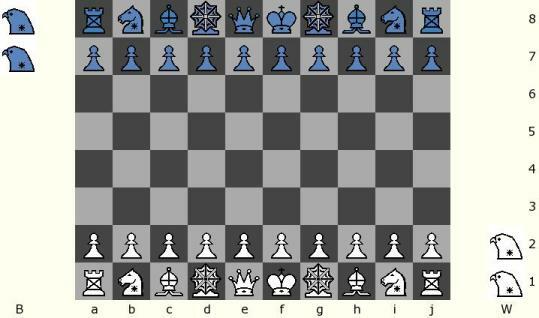 With Seirawan chess, we just need to worry about the values of the Hawk (Bishop + Knight) and Elephant (Rook + Knight); everything else can be inherited from FIDE chess. Thanks Jose for the correct date of public disclosure of invention 1996, rather than 1992 as first private play -- for Falcon Chess. I think specific board sizes are about the best categorization possible at this point. Not the only one of course, but one place to start. For example, all the 11x10's, all the 16x16's, all the 7x8's -- only one so far of the latter; get to work, prolificists. Because ridiculously anymore (in one convenient anomaly), old Editors Quintanilla, Aronson, Duniho would have little more than a clue about ongoing content of the site. You know, such recent content as Calvinball, or ''piece values by entire configurations rather than single piece,'' or one-piece-type Spartan Skaki. Not the sort of material to win over wide converts. 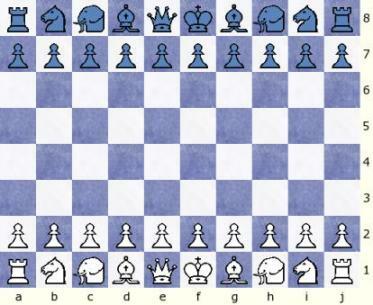 Of course any of those specific Chess experts, used as examples, could catch up on the material, given enough time, even lacking any willful organization or evaluation. My article ''Multi-path Chess Pieces'' in 2004 likewise tries to organize that important field, as Carillo's pictorial here organizes somewhat evolution of 8x10's and their further offshooting.